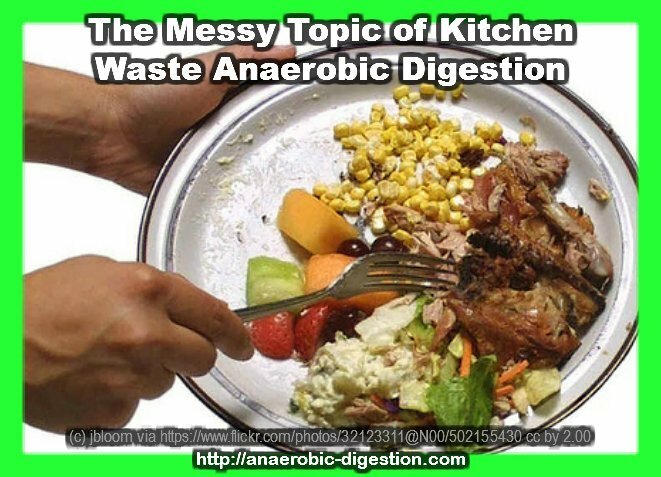 The anaerobic digestion of kitchen waste (also known as food waste anaerobic digestion) makes a lot of sense for urban communities which culturally have always prepared a lot of their food, especially where much of it is from vegetables they prepare themselves at home. In these circumstances there is a lot of organic vegetable kitchen waste from food preparation and there is an economy of scale, alongside short travel distances, between the origin of the waste and the biogas plant where it is digested. It makes less sense for communities in the west which live in sparsely populated rural areas, which are provided with separate food waste collection services. The cost, both financial and environmental can be high for such communities, and the environmental benefits become close to negligible in low population areas. That is because the benefit from the renewable biogas energy produced by anaerobic digestion can be negated by the fuel used in transport to get the rotting food to the AD plants. AD plants are usually quite large in the west and on average each plant serves more than 150,000 homes, so they are quite few and far between. However, having made this proviso, kitchen waste collections which take the kitchen waste to anaerobic digestion plants in towns and cities, is increasingly being implemented and doing so is certainly environmentally beneficial although the dis-benefit in terms of disposal cost is generally still quite high. When the alternative to separate food waste collection, would be sending this food to a landfill, or a composting facility, the cost per unit of weight would be substantially lower. Of course, kitchen waste can be anaerobically digested at all scales, from individual household biogas digester units, to huge regional facilities built by groups of local authorities which combine together to provide the necessary funding. So, let’s consider small to medium scale anaerobic digestion facilities, in the context of kitchen waste anaerobic digestion, by individuals, businesses, and by community groups. Small to medium size (inspired by interested individuals in the own homes and also small business, and community group, run) urban and rural anaerobic digestion plants do exist in many countries which can provide for very energy efficient digestion. When, in addition, the output of fertilizer materials goes to productive use, plus the biogas is purified and sold, or used on-site, both to generate electricity and also to provide CHP (Combined Heat and Power), these projects can become real flagship schemes, showing others what is possible. In addition to the increasing adoption of anaerobic digestion of kitchen waste in the municipal waste scene, kitchen waste is also being digested in the private business sector. Many food producers are starting to anaerobically digest their own kitchen wastes at factories where they prepare processed foods, and of course many restarants and corporate catering facilities anaerobically digest their own kitchen waste. Waste is diverted away from landfills where kitchen waste is the highest single waste type, other than garden waste (if landfilled) contributing to methane gas emissions. Methane on landfills can be dangerous (due to fires and explosion risks), and certainly is a major contributor to overall global greenhouse gas emissions. Kitchen waste has a high calorific value (lots of heat is bound-up in food) so when fed into an anaerobic digestion plant it produces a lot of biogas. This biogas is a wonderful fuel, and can be sold in many forms, either without being purified first, or after purification when it becomes a renewable form of the “natural gas” pumped into the vast majority of people’s homes every day. The renewable energy produced is both made where very close to where it is used (which saves on transport energy use and cost), and a clean energy source not producing pollution where it is burnt. Meaning that it can be used to fuel town and city buses and trucks in a way which reduces city and urban air pollution. The energy produced, unlike wind, and solar power is available day and night 24/7, so it is much more valuable to the community than power sources that cannot be relied upon to provide power at any time, and only do so except when climatic conditions are right. Cost: It is more expensive to digest this waste anaerobically than use alternative methods. Transport: Use of vehicles to collect the food waste from kitchens and homes, take it to the AD process facility, and dispose of the output materials, causes potential odours and increases road congestion.